Retired Air Force Major General Walter Robert Tkach, a former White House physician who served three presidents, has died of heart disease. He was 72. The retired Air Force major general, who flew into combat zones during the Vietnam War to aid the wounded, died November 1, 1989 at his Scripps Ranch, California home. Tkach was an assistant White House physician during the eight years of the Eisenhower administration and the first eight months of the Kennedy administration. He was senior White House doctor during Richard Nixon's years in office. Retired Army Brigadier General Chester Ward, who was an assistant White House physician under Tkach, described him as "a very caring, compassionate individual." "He taught me and the other people around him an awful lot about medicine, medical ethics within our political system," Ward said. "His professional competence and his ethical integrity were without peer." The LaBelle, Pennsylvania native earned his medical degree from the University of Pittsburgh in 1945 and began his White House service in 1952. In 1979, Tkach retired and moved to San Diego. He is survived by his wife, Cheryle, and sons Marc, Jonathan and John Robert. Tkach is to be buried with full military honors Tuesday at Arlington National Cemetery. WWII, Korea, Vietnam. (February 9, 1917-October 31, 1989), General Tkach was buried with full military honors in Sectin 5 of Arlington National Cemetery. 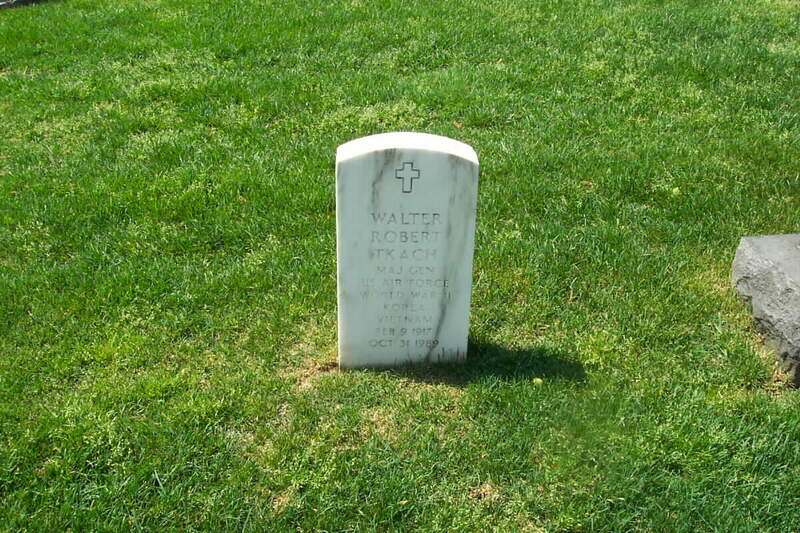 Major General Walter R. Tkach (pronounced Tuh-Kawsh) was the command surgeon of Air Force Systems Command, Andrews Air Force Base, Maryland. doctor of medicine degree. He interned at Mercy Hospital in Pittsburgh, Pennsylvania. officer. He transferred to the U.S. Air Force in 1949. From September 1949 to June 1950, he attended the Basic Aviation Medicine Course at the School of Aviation Medicine, Randolph Air Force Base, Texas. His next assignment was to the 314th Medical Group, Sewart Air Force Base, Tenn., where he was flight surgeon. In January 1951 General Tkach returned to Washington, D.C., to serve at Headquarters U.S. Air Force with the deputy chief of staff for operations, intelligence. During this period, he took courses in Strategic Intelligence and Medical Aspects of Nuclear Energy. In January 1953 he was reassigned to the Medical Officer Staff in the White House Dispensary. He later became assistant to the personal physician to the President of the United States. It was May 1961 when he reported to the 818th Medical Group, Lincoln Air Force Base, Neb., as assistant to the commander and later, was commander. In August 1962 he became chief of the Professional Division and deputy surgeon at Strategic Air Command headquarters, Offutt Air Force Base, Neb. From July 1965 until July 1968, he was assigned to Headquarters Pacific Air Forces, Hickam Air Force Base, Hawaii, as director of Professional Services and deputy surgeon. General Tkach then became command surgeon for Headquarters Seventh Air Force, Tan Son Nhut Airfield, Republic of Vietnam, from July 1968 until January 1969, when President Nixon asked him to become White House surgeon. On Sept. 16, 1974 he became command surgeon of the Air Force Systems Command. He is a member of the American Medical Association, Washington County (Pa.) Medical Society, Aerospace Medical Association, Association of U.S. Military Surgeons, Society of U.S. Air Force Flight Surgeons, Federal Hospital Institute Alumni Association, Air Force Association, and the Alumni Associations of the University of Pittsburgh and Pennsylvania State University. His military decorations and awards include the Distinguished Service Medal, Legion of Merit, Bronze Star Medal, Air Medal, Air Force Commendation Medal, and the White House Service Medal. He holds the aeronautical rating of chief flight surgeon. He was promoted to the grade of Major General effective July 1, 1972, with date of rank July 1, 1969.